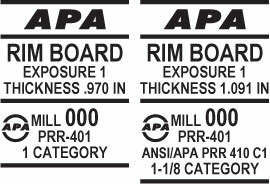 APA Performance Rated Rim Board is a specially designed component, designed to work in concert with the foundation and floor framing members to deliver a complete engineered wood solution. 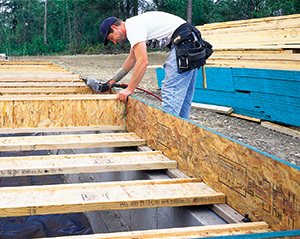 With high strength, dimensional stability, and structural reliability, Rim Boards perfectly match the depth of wood I-joists and offer highly predictable performance and consistent quality. APA Performance Rated Rim Board may be manufactured with plywood, oriented strand board (OSB), glued laminated timber (glulam), or laminated veneer lumber (LVL) and is available in lengths up to 24 feet, depending on the product used. 1", 1-1/8" thick; depths to match I-joists (9-1/2" to 24"); lengths up to 24' for some products. APA Performance Rated Rim Board is used in floor systems as the structural component that fills the space between the sill plate and bottom plate of a wall or, in second floor construction, between the top plate and bottom plate of two wall sections. Includes connection requirements and application notes for APA Performance Rated Rim Boards. Access a complete list of APA publications about Rim Board in APA's Resource Library. ESR-1210: Roseburg Forest Products Co. Learn more about the competitive advantages of a raised wood floor system in Raised Wood Floors: Case Studies in Progressive Home Construction, Form K110.